So I was walking down the street recently and something sparkly on the ground caught my eye. 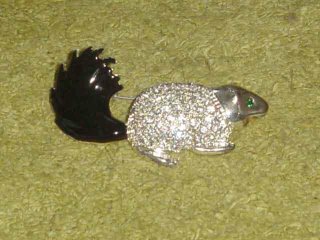 I bent over to pick it up, and low and behold it was a rhinestone pin of some sort, perhaps a pin my grandma would put on her outfit to "add some glitz." I put the pin in my pocket and walked home, and have since been sharing the find with my friends, but none of us can figure out just what the heck this pin is a pin of. Is it a squirrel? A skunk? A rat with a fluffy tail? Seriously, what the heck is this pin a pin of? A possum? A beaver? A raccoon? What do you think?